Not including Crimea, a plurality of Ukrainians (43%) say it is more important to have strong ties with the EU instead of Russia. Less than half as many prioritize relations with Russia (18%), while 27% say it is important for Ukraine to have strong ties with both. 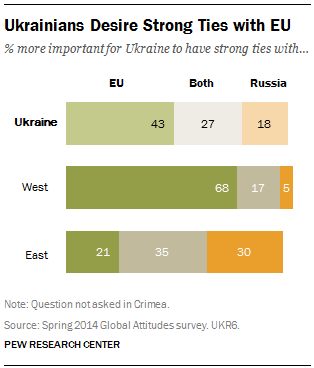 Residents of western Ukraine are the most supportive of strong ties with the EU (68%) – just 5% say relations with Russia should take precedence. Eastern Ukrainians are divided: roughly two-in-ten (21%) say good relations with the EU are more important, 30% say the same about ties to Russia and 35% say both relationships are important. Within the east, Russian-only speakers lean more toward Russia (42%) than the EU (12%), although a sizable percentage says both (34%). In addition to these regional divisions, younger Ukrainians, ages 18-29, are more likely to prefer strong ties with the EU (53%) than those 50 or older (36%). Among the foreign nations and organizations asked about in the survey, the EU receives the highest rating for having a positive influence on Ukraine, with particularly high ratings in the western part of the country. 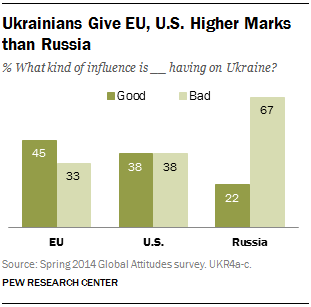 Still, fewer than half of Ukrainians (45%) overall say the EU is having a good impact on their country. This result is similar to the last time the question was asked in 2009 (40% good), even as negative evaluations have roughly doubled over the past five years from 15% in 2009 to 33% today. Nearly four-in-ten (38%) give the U.S. positive reviews for its role in Ukraine, but the same percentage (38%) says American influence is bad. Unlike the EU, evaluations of the U.S. have improved, increasing from 24% to 38% positive between 2009 and 2014. Russia’s image, by contrast, has sharply declined over the same period. In 2009, 46% of Ukrainians thought Russia was having a good influence on the way things were going in their country, while just a quarter saw Russia’s role as negative. Today, opinion has reversed: just 22% say Russia’s impact is positive, compared with two-thirds who say Russia’s influence is very bad (49%) or mostly bad (18%). Unfavorable opinion of Russia may be linked, in part, to doubts that the Kremlin sincerely cares about civil liberties in Ukraine, let alone in Russia itself. When asked, six-in-ten Ukrainians respond that Moscow does not respect the personal freedoms of its own citizens. Within Ukraine, there are deep regional and language divides over the influence of foreign nations and organizations. Western Ukrainians are much more positive toward the EU (74%) and the U.S. (68%) than those in the east (24% for EU, 17% for U.S.). Meanwhile, residents of Crimea overwhelmingly rate the EU and the U.S. as having a negative influence on Crimea (89% bad for EU, 88% bad for U.S.). Regarding Russia, majorities in both western and eastern Ukraine say their neighbor is having a bad influence on Ukraine (87% and 58%, respectively). Russian-only speakers in the east are divided on Moscow’s influence (41% good, 44% bad), but notably give higher marks to Russia than they do to either the EU (17% good) or the U.S. (14%). When asked separately about Russia’s influence on their territory, Crimeans are unequivocal in describing Moscow’s impact as positive (92%). The public in Ukraine has little confidence in some of the key international leaders involved in the nation’s crisis. Vladimir Putin, in particular, fares poorly. Just 23% of Ukrainians have confidence in the Russian president to do the right thing when it comes to world affairs – down 33 percentage points since the question was last asked in 2007. Few Ukrainians in either the country’s west or east have faith in Putin (7% and 28%, respectively). However, trust in Putin is significantly higher among Russian-only speakers in eastern Ukraine (43% confidence). By contrast, Crimeans are clearly enamored of Putin: 93% express confidence in the Russian president, including 80% who say they have a great deal of confidence in his handling of foreign affairs. Looking to the U.S. and Western Europe, Ukrainian opinion of U.S. President Obama remains divided, much as it was three years ago. Today, 44% express confidence in him and 48% do not. As in recent years, German Chancellor Merkel is generally trusted, with 50% of Ukrainians expressing faith in her decision-making on foreign affairs. However, lack of confidence in the German leader has increased from 20% in 2011 to 40% today. Western Ukrainians express much more confidence in the German head of state (71%) and the American president (70%) than easterners (37% and 27%, respectively). Again, Russian-only speakers in the east express less positive attitudes toward the German and U.S. leaders than Vladimir Putin. Just 27% of Russian-only speakers in the east say they have confidence in Merkel, while 19% say the same about Obama. In Crimea, few trust either Merkel (13%) or Obama (4%).